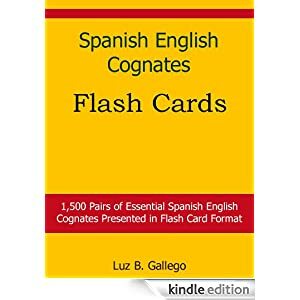 Teaming up with Luz B. Gallego, we published our first Kindle book: Spanish English Cognates Flash Cards. learn these Spanish words that are related to weather. hopefully can help you build up your Spanish vocabulary. The convertible words between Spanish and English are called “cognates“. These Spanish English cognates usually have the same roots. The Spanish English cognates are a hidden gem for English speakers who are learning Spanish (or for Spanish speakers who are learning English). However, there are also many “false Spanish English cognates“. These pairs of words look similar in Spanish and English but their actual meanings can be very different. It is not uncommon for English speakers to use these false cognate words incorrectly without knowing it. To avoid making such mistakes in Spanish, it is to the student’s advantage to learn and master these Spanish English false cognates. Following is a list of 56 common false Spanish English cognates. You can download a PDF of this false Spanish English cognates list at the end of this page. Besides money, bill has several other meanings in English: cuenta; proyecto de legislación. n. 1) a camera, 2) a camera operator, 3) a chamber. 2) fine or ok, as in answer to ¿Cómo estás? n. presente. ‘Gift’ in Spanish is ‘regalo’.